Commercial – Leaving it clear in the dark! We’re at that stage of year where everything happens at once…. and this year it seems to be accentuated by the mild, calm weather we are having. The grass is still growing, so of course needs cutting. The weeds are still battling away and showing their heads, so of course need dealing with. The leaves are falling, but at a slower rate than usual because of the lack of wind, so the leaf clearance will spread over a longer period of time this year… And the hedges and shrubs are still forcing new growth, so of course need cutting back! It’s busy, busy, busy! But we love it! Add to all that, if you will, another challenge…. what do our residents usually do in the mornings? They go to work; thus emptying the car parks and giving us room to clear leaves and cut hedges. But turn that on its head…. What if we are working at one of our commercial properties? The car park fills up… and early! This gives us a small window to get our work done thoroughly before our space runs out! Take it from me, clearing a car park in the early morning dark isn’t the easiest of things…. 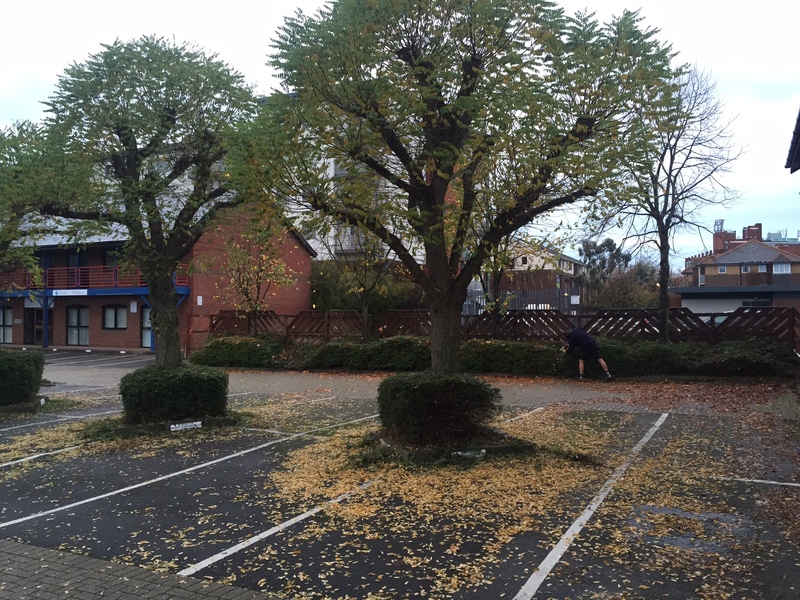 But it’s a challenge we all enjoy and get stuck into; leaving our commercial car parks leaf free and tidy…. Until next visit!